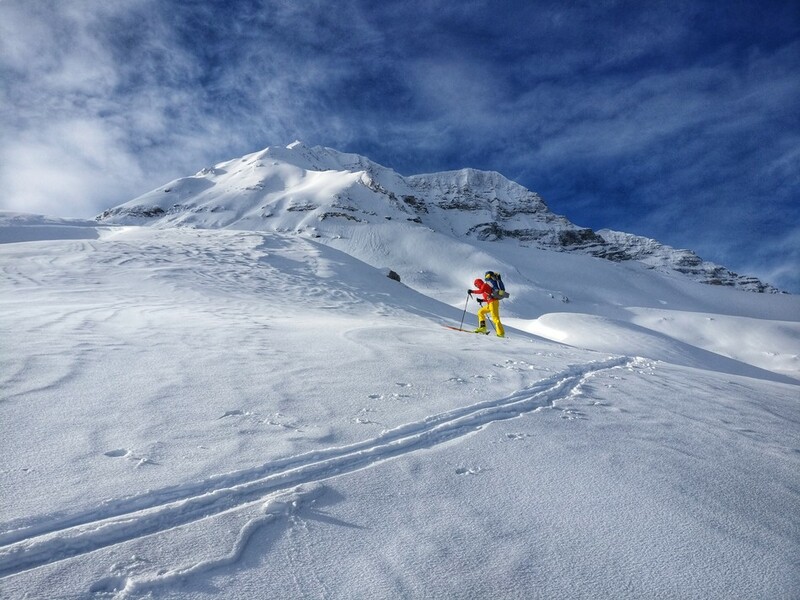 The Bow-Yoho Traverse is an unforgettable backcountry ski mountaineering experience exploring some of the seemingly endless and vast high altitude icefields of the Canadian Rockies. The length of the full traverse varies depending on the exact route one takes. 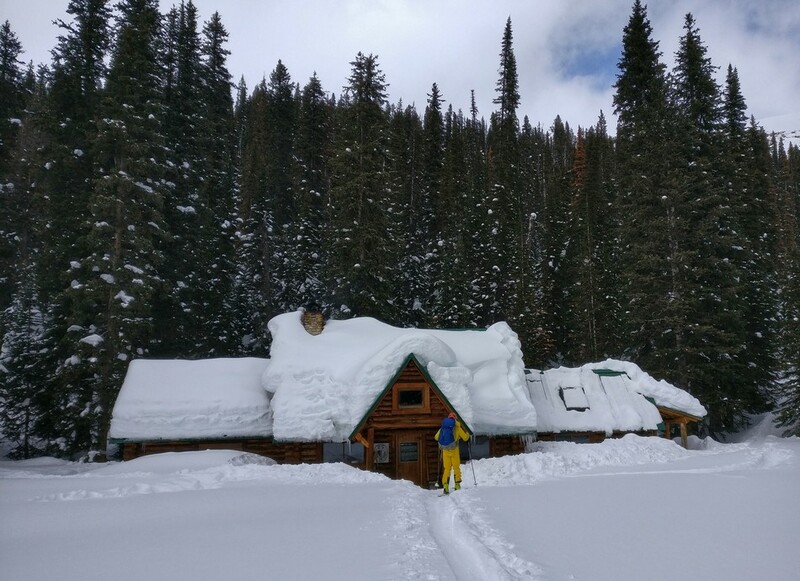 For our group, over a 5-day period we skied from the 93N highway to Bow Hut (8km), Bow Hut to the Richard and Louise Guy Hut (12km), Guy Hut to the Stanley Mitchell Hut via the Whaleback (~13km), and Stanley Mitchell Hut to the Emerald Lake parking lot via the Iceline trail (15km). The mission was completed by our party of four – myself, my partner Ian, and our friends Carl and Cole, each of us bringing a diverse range of mountain skills and stories to the table. After working a long, full weekend on my feet at my job, the prospect of an early start seemed daunting. 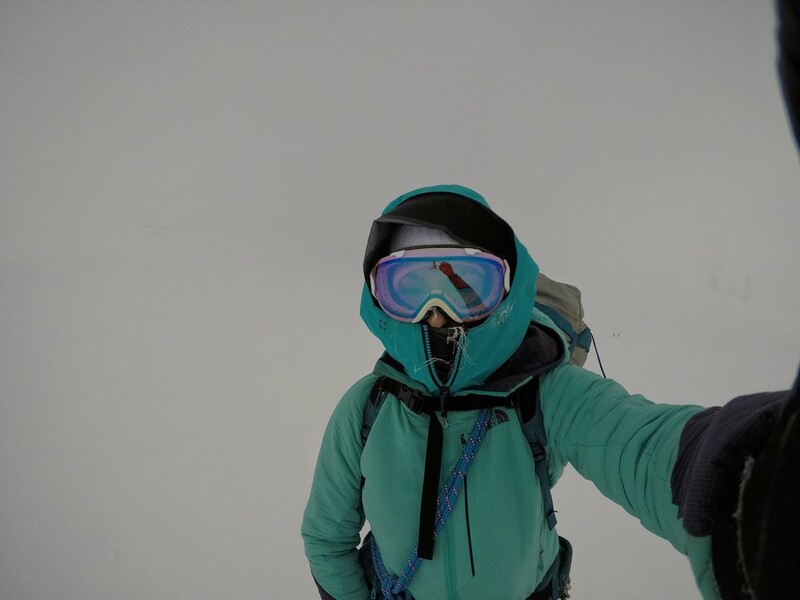 Fortunately, the team was on board with the idea of a later start, given that the route in to Bow Hut was short, simple, and easy to navigate. We left Calgary at the leisurely hour of 10:00am, and shuttled one vehicle to the planned ending location at Emerald Lake, and the other vehicle to the starting lot at Bow Lake. 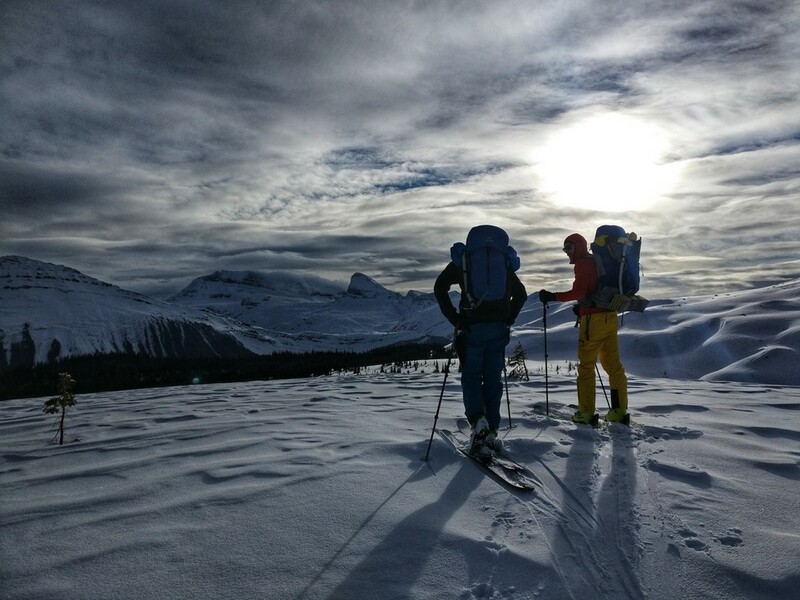 We heaved our heavy packs onto our backs, and left the truck at 2:50pm, skiing across Bow Lake with an icy cold wind in our faces. The route wound its way through a narrow canyon, with the sound of water flowing beneath our feet; only a few inches of ice separating the divide. The canyon opened into an impressive valley, ending in a huge rock cliff with a giant serac of glacier ice slowly spilling over its edge. We climbed the short but steep headwall up to Bow Hut, arriving by 5:30pm, well before dark, despite the very late start time. The hut was already warmed by friendly parties which had already been there for some time, with whom we shared hilarious stories, and a couple shots of brandy and rum. 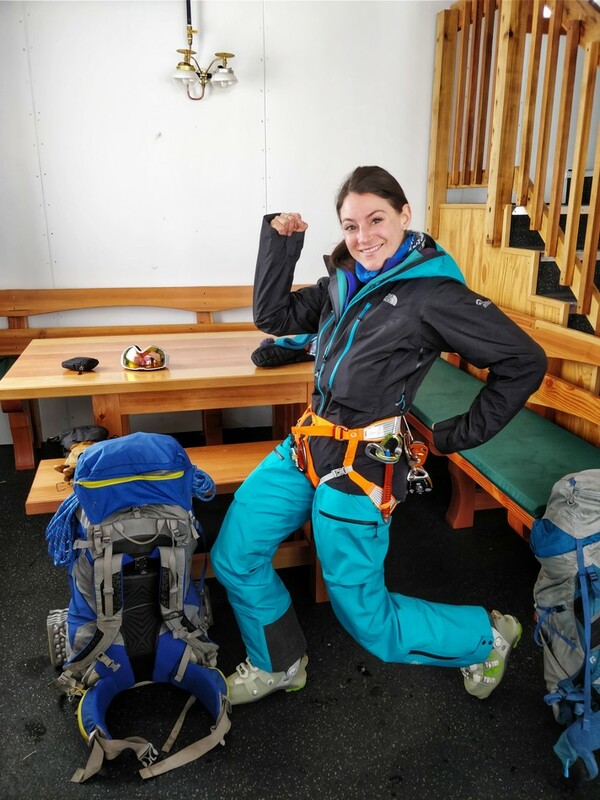 In the morning we cooked and ate our oatmeal with apples dehydrated at home, re-packed the bags and set out from Bow Hut, donning our harnesses, glacier kit and rope. The sun pushed through the clouds giving us beautiful light on Saint Nicholas Peak as we skied past. Our route this day was going to be approximately 12km and on glaciers for almost the entire way. Although the morning started out somewhat clear, the wind, clouds and snow eventually picked up, blasting us in the face from a seemingly horizontal direction. The sky turned as white as the snow beneath our feet, and we lost the ability to see much or any definition on the horizon. We were forced to rely on our GPS devices for navigation, since we could no longer distinguish any surrounding peaks or rock features to help us orient ourselves. A new problem presented itself; the three GPS devices were either positioning us differently, or were showing different tracks. The conflicting information left us confused and after every couple hundred meters of travel we had to stop to consult each device again, and discuss the plan of action for the next few hundred meters. Should we go a little further left? A little further right? Do we need to backtrack a little and then go left? In the meantime the slow travel meant we couldn’t move very quickly, and I needed to put on almost every layer I’d brought with me just to stay warm enough as the ferocious wind continued to chill us. Fortunately, we eventually found ourselves on the corniced ridge that would lead us down toward the Richard and Louise Guy Hut. 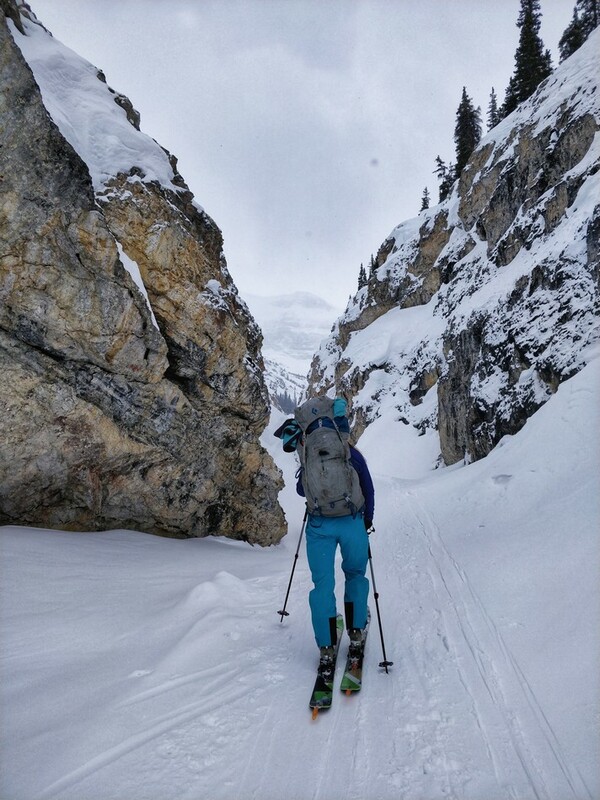 With some rock features to help guide our way, we arduously skied down the final icy slope, mentally drained, and a little dazed with vertigo from the endless whiteness. The Guy hut was indeed a welcome sight. The recently constructed building features electric radiators for heating, a drying room, and electric lights, all powered by solar and wind turbines attached to the structure. After tearing off our wet and cold gear we cooked up our dinners, engaged in a stretching party, and entertained ourselves with some interesting literature: a “backcountry erotica” novel left behind by a previous hut guest. From the Guy Hut we skied and side-stepped downslope through a rock band to reach the impressive Yoho Glacier. Conditions were still overcast but at least the wind had died down overnight, and I could wear one less layer than the day before. 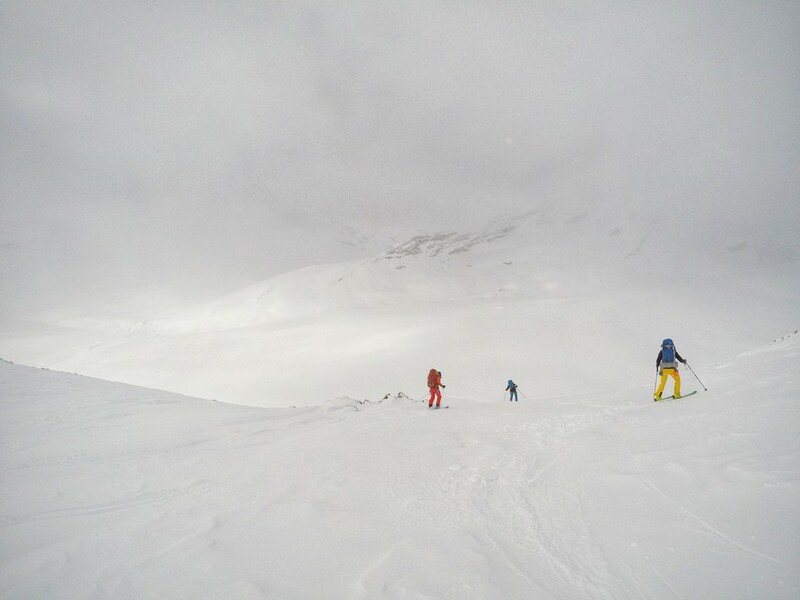 Once again we roped up and travelled as a team across the great white expanse. 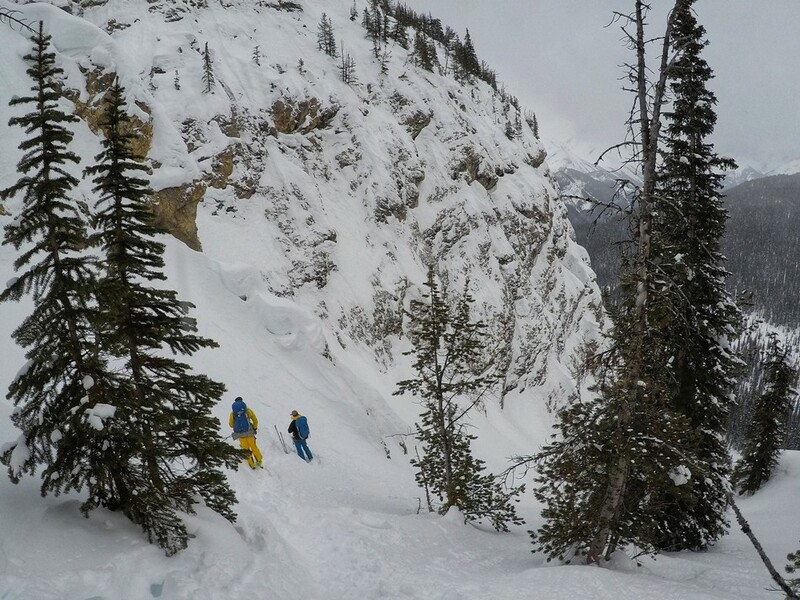 Avalanche conditions were cooperating so we were hoping to take the ideal route on this day. 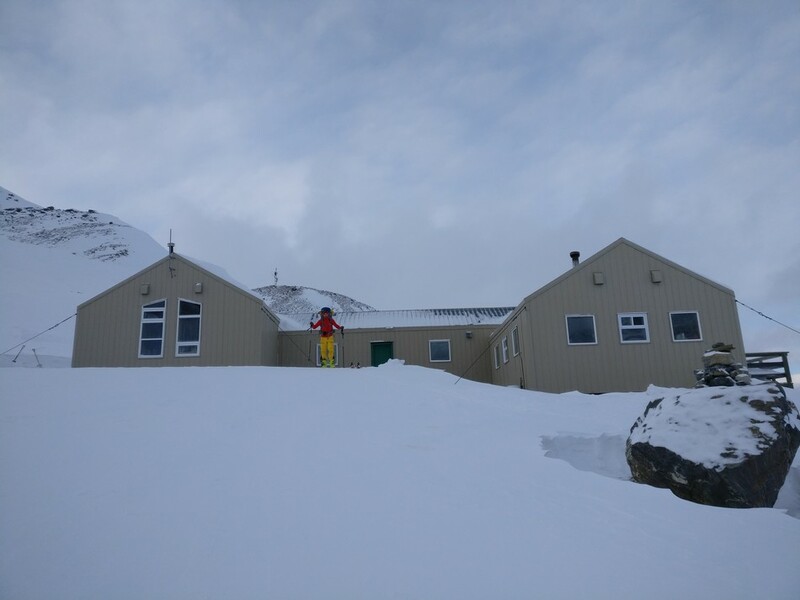 It was to be a short 7.5km from the Guy Hut to the Stanley Mitchell Hut, including a steep climb through Isolated Col, and a fun ski down. 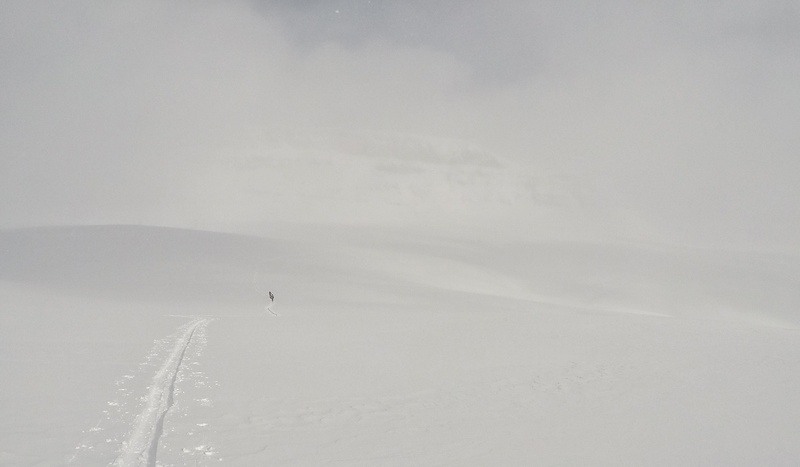 When we arrived at the base of the climb to Isolated Col, however, the face was largely obscured by cloud, but from what we could see, the climb was going to be a lot steeper than anticipated. I could feel fear creeping in and doubts entering my mind. The team faced a decision. Continue the climb as planned, despite not being able to scout it very well and despite some uncomfortable feelings, or to double back and take the safer, albeit much longer route. The conservative voice prevailed in the conversation, and we aborted the climb. 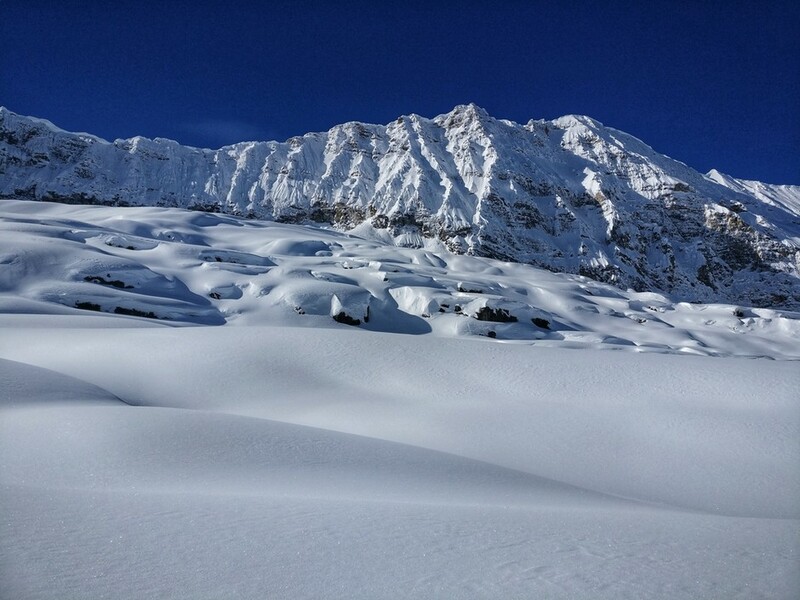 Instead we skied down through a beautiful canyon in the valley, breaking trail in deep snow, and rounded Whaleback Mountain. 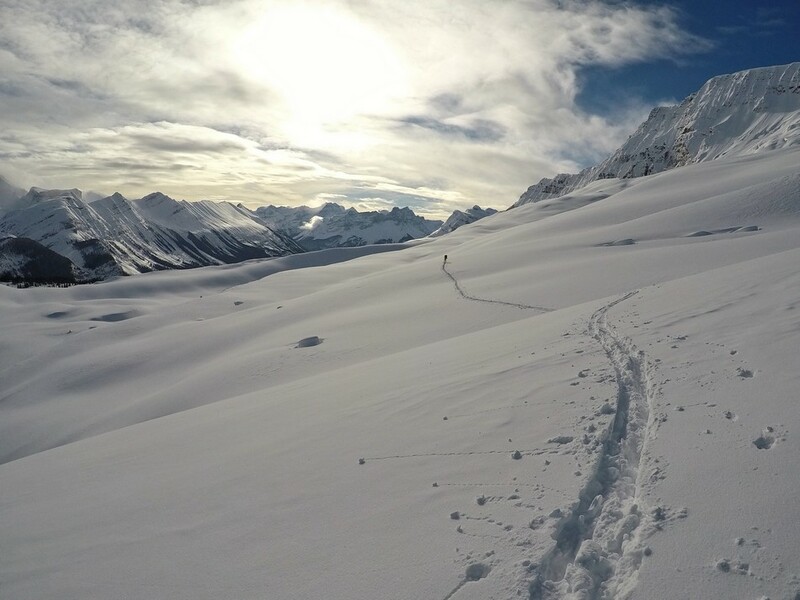 We crested the shoulder at roughly the same place as the summer trail – what should have made for a simple descent into the Little Yoho Valley and our final stretch. Instead, below the shoulder what we found is that our route cliffed out. The time it had taken us to double back and re-route through deep snow had cost us and the hour was just past 4pm – getting close to dark. 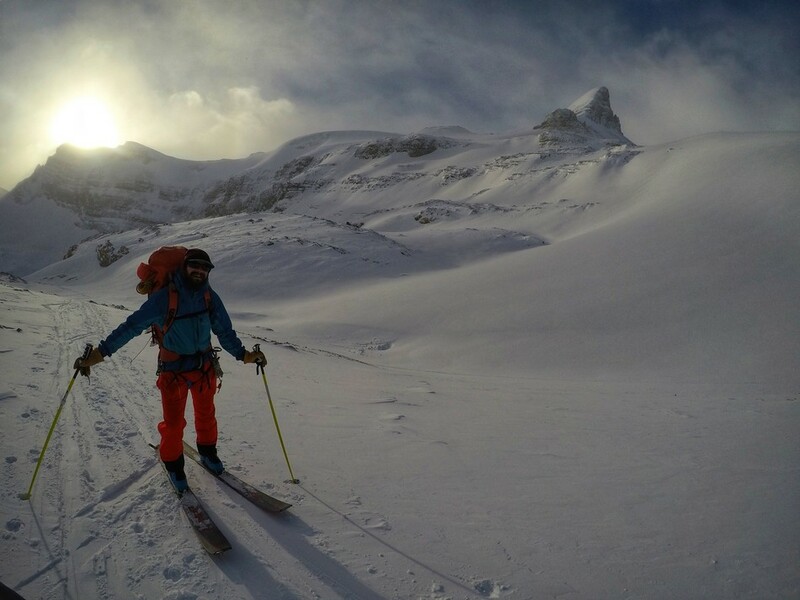 On top of this, Ian’s skins were no longer sticking to his skis and had to be strapped on, making travel more difficult. 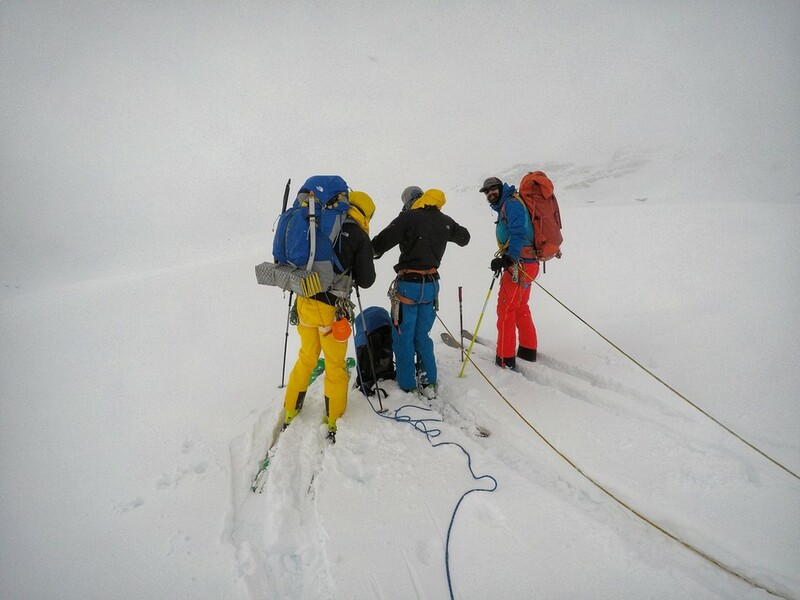 We searched the ridge for a way down and eventually sent Carl down a crest to investigate. Initially it looked like the crest also cliffed out, too, but Carl managed to find a way in which we could hop into a couloir to (hopefully) reach valley bottom. It worked. From the valley bottom the route was simple. We followed a well cut skin-track for 3km, managing to reach the hut just before dusk. Stanley Mitchell is my favourite ACC hut, a cozy wooden cabin built in 1939. Already warmed by another party, we gratefully collapsed into chairs by the fire to rehydrate and debrief the long day. Considering how draining the previous two days had been, Ian and I were quite content to spend a fairly relaxed day at and around the hut, skiing minor objectives nearby. 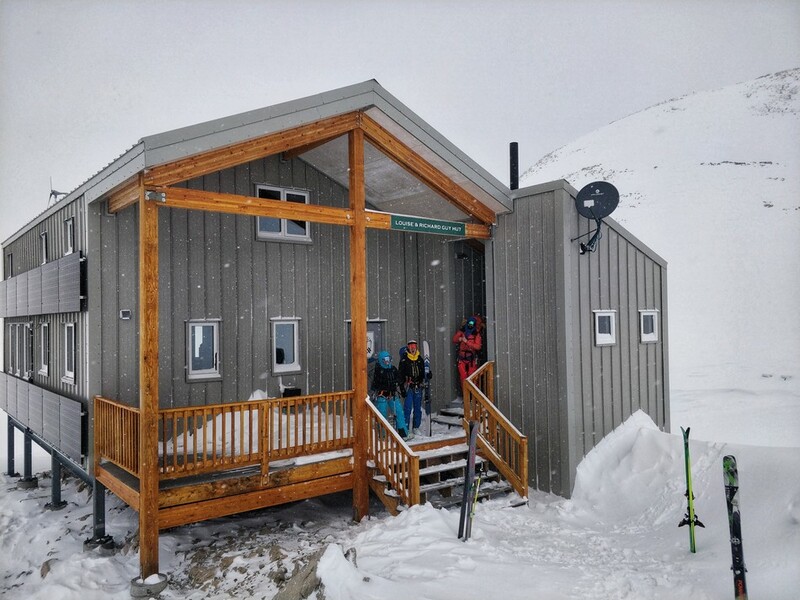 In addition, we had stayed at the Stanley Mitchell Hut for a few days last year, so we didn’t feel overly motivated to get after some of the bigger objectives we’d skied just last year. Cole and Carl, on the other hand, were keen for an attempt on the President and Vice President mountains. We spent much of the morning bumming around the hut and doing little chores like chopping wood and melting snow. In the afternoon we ventured out to some powder slopes near the hut, which was lots of fun. The evening was spent sharing music, stories, and delicious food. We headed to bed early knowing that the next day was due to be a longer one. We woke up about an hour earlier this day with the knowledge that our ski was going to be at least 15km, if all went well. The planned route was following the summer Iceline trail, which would drop us back down to Emerald Lake where we had parked the other vehicle. But we weren’t sure what to expect of the route conditions, weather, or timeline for the day. Good thing we got lucky. 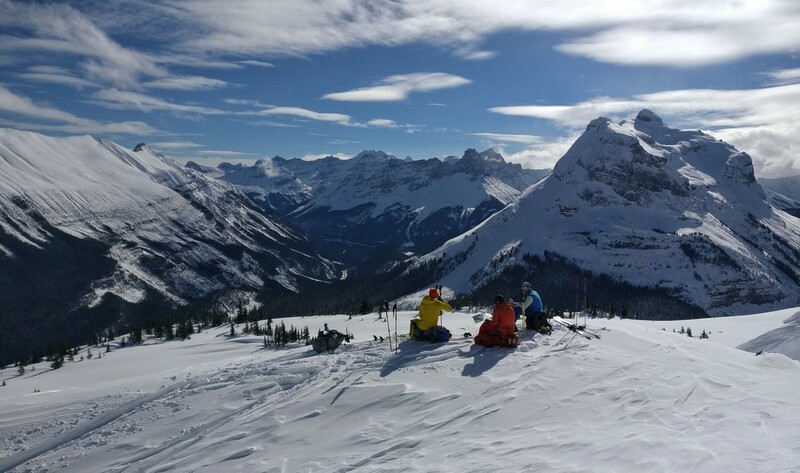 By far the nicest weather of the trip was on the ski out; a perfect trail to take on a bluebird day with spectacular views across the Yoho Valley and the Wapta Icefields. The excellent clear weather made for simple navigation and fast travel so we could spend our time admiring the landscape instead. Following the Iceline trail we had to navigate some interesting cliff bands and an avalanche path riddled with icefall, but otherwise travel was simple, and we were back to the parking lot earlier than expected. Chips and sausage welcomed us at the vehicle, along with comfy shoes, big hugs and a couple of high-fives. 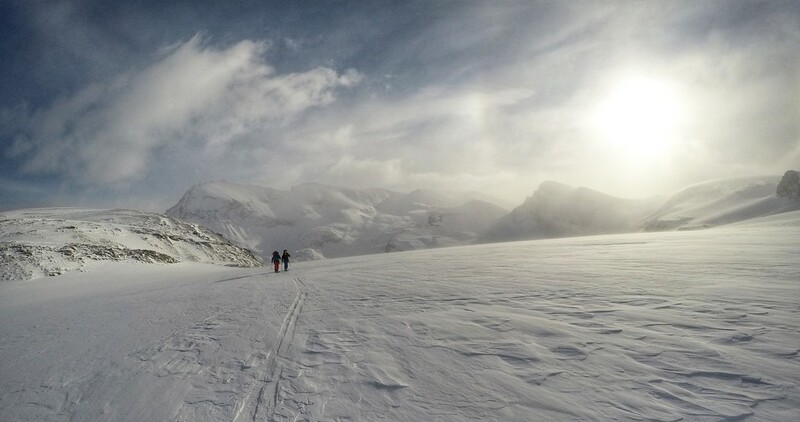 Although it didn’t come without its challenges, the Bow-Yoho Traverse was a huge (and fun) success! What a great adventure . You don’t mention it but when crossing the glacier are you concerned about unseen crevasses?